The Ultrasonic Level Transmitter is designed to measure liquid levels. Ultrasonic waves are used to measure level of liquids and solid objects in industries. Ultrasonic level measurement is contactless principle and most suitable for level measurements of hot, corrosive and boiling liquids. Ultrasonic Sensor is an important part of the ultrasonic level Transmitter instrument. This sensor will translate electrical energy into ultrasound waves. These sensors are capable of sending ultrasound to an object and receive the echo developed by the object. The echo is converted into electrical energy for onward processing by the control circuit. Webcal, an innovative PC user interface that provides fast and accurate configuration. Optimize sensor placement with unmatched beam width for application with restricted space. Industry leading miniature dead band maximises the filling capacity of vessels. Polycarbonate enclosure rated NEMA 6P with PVDF transducer. The general purpose two-wire ultrasonic transmitter providers non-contact level measurement up to 32.8” (10m), and is well suited for challenging ultrapure, corrosive, slurry or waste liquids. The transmitter is broadly selected for atmospheric bulk storage, day tank, waste sump, process vessel, IBC tote, 55 gallon drum and waste sump application. Media examples include acetic acid and resin. EnhoPod is configured using flow line’s webcal software and Fob, a USB interface tool. A single configuration can be easily created, saved, duplicated, emailed or modified. Take control of your level process with Webcal’s intuitive set point graphics and custom wiring diagrams for each of your configuration. It’s level configuration make simple. Offered in a type 6P enclosure with cable interface, the general purpose ultrasonic level transmitter provides continuous level measurement up to 32.8' (10m) with a 4-20 mA signal output, and is configured via our free WebCal software. 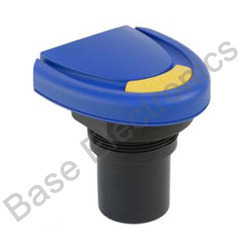 This non-contact liquid level sensor is ideally suited for corrosive, ultrapure, sticky or dirty liquids, and is broadly selected for bulk storage, day tank, lift station and process tank level applications. Industry leading miniature dead band maximizes the filling capacity of vessels.